Paris is known for its wonderful architecture, sleepy streets, and lively crowds. In addition to all the Gothic churches, monuments, museums, and medieval buildings, if Paris is to give anything, then it would be the exotic beaches located nearby! The stunning beaches near Paris flaunt its beautiful scenery and spectacular blue water, which are good enough to increase excitement multiple times. Turquoise water, golden grained sand, and blue silk sky are what all you need for the vacation vibes. The extension of shades of blue and yellow along the long coastline is bordered with some wonderful beaches that you wouldn’t want to miss. So, here are some of the beaches near Paris where you can plan a quick escape & experience the best of blue waters! 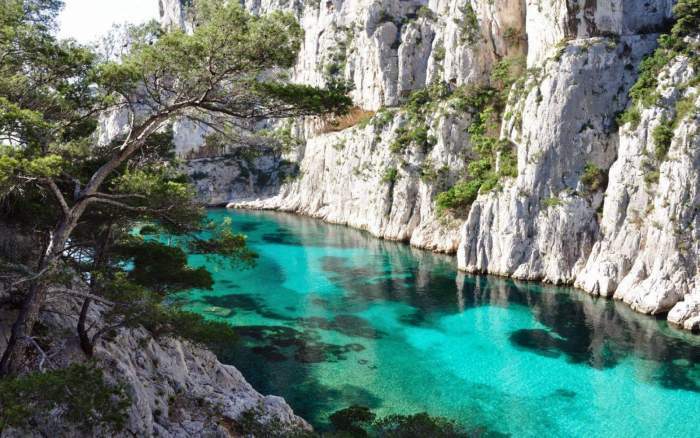 The Les Calanques de Cassis outside Marseille is a beautiful piece of nature that your eyes should not miss. The beach lies in the fjords city of Marseille and Cassis showcasing beautiful bays. These bays have a magnificent atmosphere and blue jewel waters, which is one of the best Paris beaches. The bizarre location outside Marseille is a nature lover’s fantasy. The shoreline of the beach has quite a few Instagram-friendly spots, which will make you force to fall in love with. Total time taken and the distance from Paris to Les Calanques de Cassis: 8h & 14min & 841 km. Famous activities at Les Calanques de Cassis Beach: At the Calanques National park, people will enjoy hiking, kayaking, boating, and swimming. Best Accommodations: Hotel de la Plage Mahogany, Hotel Royal Cottage, Best Western Hotel La Rade, Hotel du joli bois, Hotel Le Cassiden. Le Cote des Basques Paris has another amazing beach near Paris which is as beautiful as anything. Wild surroundings, high tide crashes, and natural stone define the aesthetics of the place. If calmness and serenity is your type, then this beach is for you. It’s one of those places for a wonderful family trip. Also, the beach creates an exciting place for surfers to calmly ride the playful waves. 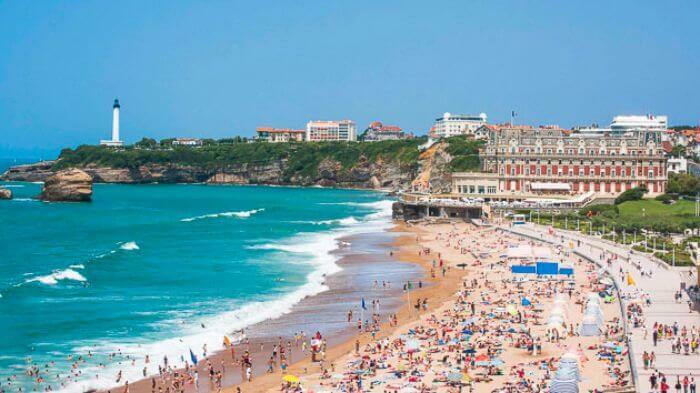 Famous activities at Plage de la Côte des Basques Beach: Surf around Biarritz and hike up to the nearby castle. Best Accommodations: Hotel Edouard VII, Radisson Blu Hotel, Hotel Alcyon, Le Grand Large – Residence, Le Gamaritz, Brit Hotel Marbella, Best Western Kemaris. The coastline keeps overflowing with a dozen of activities all around. Just have a lazy walk along the Mediterranean coast and see what your interest you! Prado beach is one of the exciting beaches near Paris if water sports is your love then Prado beach is an ideal place for a vacation with family and friends. By the sea coast, there’s a long stretched open land known as “Parc Balneaire,” where people just lie down and relax. 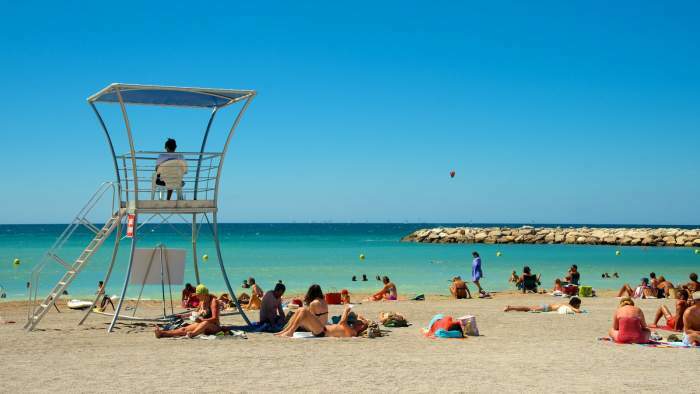 It’s one of the best beaches near Paris. Famous activities at Prado Beach: kayaking, sailboarding, Snorkeling fun rides at Parc Balneario, annual beach fest – Festival of the Wind is celebrated every September which is a must-attend, and volleyball & rugby programs in the stadium nearby. Best Accommodations: Residhotel Grand Prado, Aparthotel Adagio Marseille Prado Plage, nhow Marseille. Also Read: 11 Best Beach Resorts In Turkey To Amaze You! This beach can be a good scenic getaway with family and friends. Beauty, peace, and happiness all come in the package here. 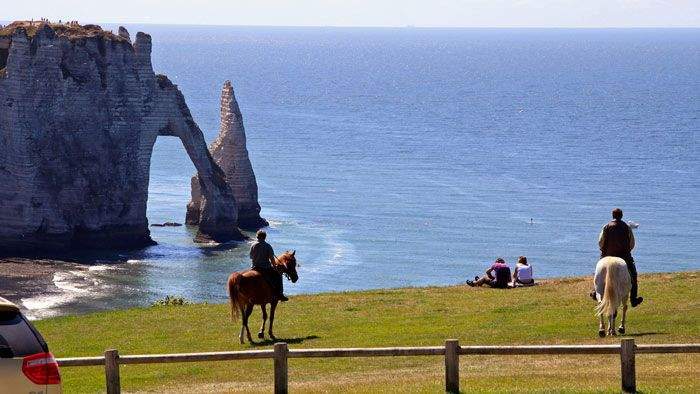 Etretat beach in Normandy is the natural beauty at its best. There are beautiful structures all around the beach, which use rocks, and attractive white stones make it one of Paris’s most beautiful beaches. At the time of sunset, all the lights and the sun create magic along the sea, which makes this place like a paradise of which heaven would get jealous! Best Accommodations: Les Galets Bleus, Hotel Restaurant Pub La Sirene, B&B Normandie, Les Voiles, La Baraka, Le Clos des Ifs. 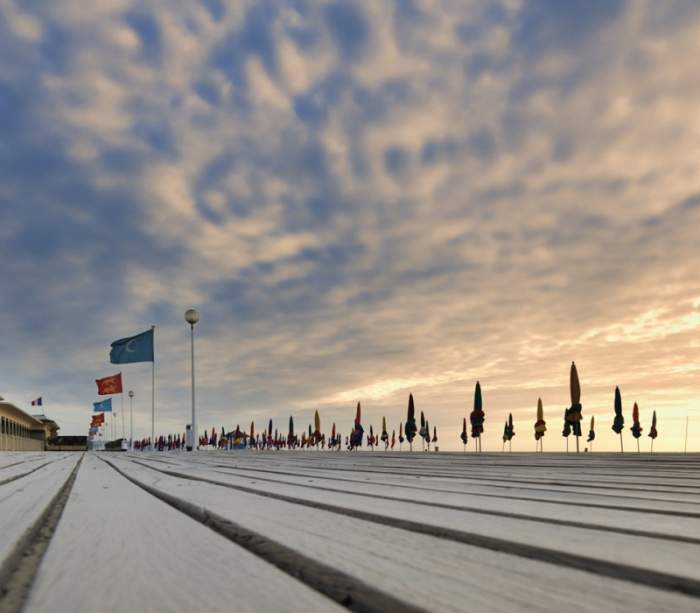 The Deauville beach in Normandy is the closest beach getaway and one of the best beaches near Paris which has quite easy access. With an amazing boardwalk, this beach narrates a romantic walk for every couple. The beach is definitely the perfect place surrounded by the perfect fusion of turquoise water and golden sand and is lined up with umbrellas, huts, and Parasols. Total time taken & distance from Paris to Deauville Beach: 2h & 35min & 201 km. So, just drench yourself amid coves or take a dip in the blue waters; lie down on sandy beaches surrounded by stunning cliffs or fill your heart with the beauty of sky; the best of beaches near Paris awaits you. Best Accommodations: Ibis Deauville Centre, Almoria Hotel & SPA, Ibis Budget Deauville, Hotel de la Paix, Hotel Le Chantilly, Ibis Styles Deauville Centre, Soleil Vacances Beach Hotel.